Rave reviews from all over the world are flooding in about the Colorado Model Railroad Museum, located by the mainline of the Union Pacific Railroad in Greeley, Colorado. This one-of-a-kind facility features over 600 railroad-related artifacts ranging from a Virginia and Truckee Railroad switch key to a full-sized Colorado and Southern wooden Caboose available for examining both inside and out. Designed to appeal to visitors of all ages and nationalities, the CMRM has set record attendance marks in its first four years of operation and has become the leading year-round tourist attraction in Weld County, Colorado. The highlight of the museum is its huge, 5,500 sq. ft. operating model railroad dubbed “the finest model railroad I’ve ever seen”, by the 30-year senior editor of Model Railroader magazine, Jim Hediger, Milwaukee, WI. Visitors may actually stroll through this three dimensional creation while the railroad is in operation. They are surrounded by rugged mountains with handmade features including 16,000 fir, 8,000 deciduous and 4,000 aspen trees with rivers abound. Scenery becomes three dimensional art. The use of cameras is encouraged and guides are available to answer railroad-related questions and to point out unique aspects of this one-of-a-kind modeling wonder. Take a visual tour through this amazing railroad in miniature via the CMRM website, then plan of visiting the museum in person the next time you visit Colorado. Sorry for some of the quicker and shakier shots, I went on a busy day and there were a lot of people there, so I was trying to be quick. 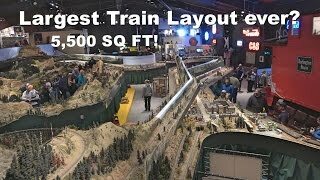 Please subscribe, and check out my other model train videos!